SALT-X For Those Super Powerful Trick Painted Bikes! These are beautiful bikes owned by serious bike lovers, they represent A Large Investment In Both Dollars & Work Hours! With the investment required for these mean machines the Ultimate In Protection From Salt & Corrosion is essential. Washing & Rinsing Saltaway From These bikes Ensures Longevity & Safety. The chrome and brightwork on these machines must be kept salt free and clean to ensure corrosion does not get started. The Ultimate Protection With SALT-X is highly recommended. SALT-X will not harm paint or chrome. SALT-X does not attack grease, oil or rubber, so do yourself a favor and use SALT-X to wash and rinse saltaway. Listed Below Is One Of These Unique bikes. 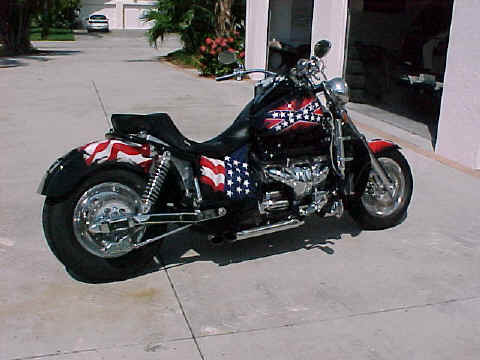 Send Us A Picture Of Your Bike & We Will Gladly Post It On This Site.